The church of St Martin, Ryarsh, is a Norman foundation first mentioned in the Textus Roffensis, which described an event in 1081. A few years later it is mentioned in the Domesday Book. 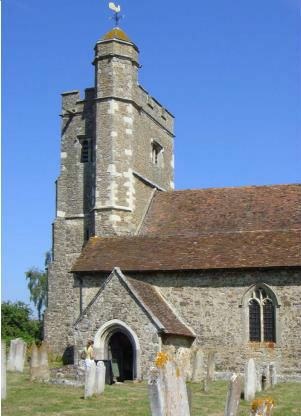 As part of the Manor of Bishop Odo, half brother of King William I, the church was originally dedicated to St Lambert. However, his feast day fell during harvest and often coincided with the Ember Days. In 1448, the Bishop of Rochester was petitioned and the dedication was changed to the feast of St Martin of Tours which is on November 11th. The original two cell church was enlarged in the 14th century with the building of a south aisle and a porch, and again in the 15th century when the tower was constructed. In 1752, the South Aisle roof was renewed. The church interior was restored in 1871/2; and the organ vestry was constructed and the organ installed in 1885. Boundary changes in 1846 caused the parish of Ryarsh, in the Deanery of North Malling, to move into the jurisdiction of the Diocese of Canterbury. It reverted to Rochester Diocese after further boundary changes in 1905. The four parishes of Birling, Addington, Ryarsh and Trottiscliffe came together under one minister in 1977, and were united in a single benefice in 1991 forming the BART group of churches.